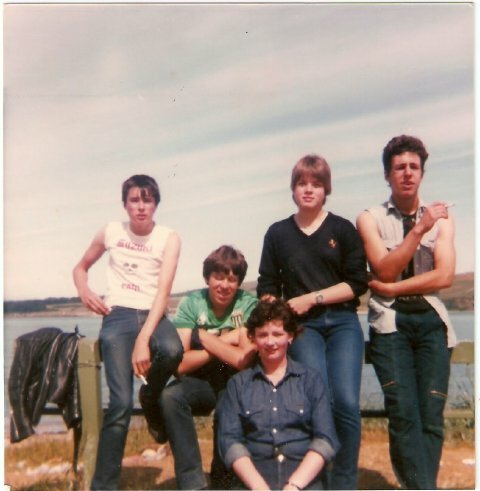 Cromarty Image Library - Yobs on Shore St! Paul Shepherd, Alan Storey, Kerry Pryor, Ian Blades and ? The 5th person is Vicky Stroyer. What a Handsome Bunch we were ! Funnily enough my daughter didn't recognise me in this photo ! Sad to Hear Valerie Straugheir Had Died. I assume that it was Vicky that left the message See picture #1330 comments. I to am sorry to hear about Val, many a good night we had at the dart nights. Paul, Sue and Duncan, thank you so much for your comments reference my mum, Valerie. This piccie sure does bring back some memories!!! Alan is now married and lives in LINCOLN. Ian Blades' now living in Edinburgh, does anyone have Vicky Barker(nee Straugheir)'s email address?